Zippity Doo Dah! | Sew Lindsay, Sew! You know it’s going to be a good day when the Google Doodle makes you smile. 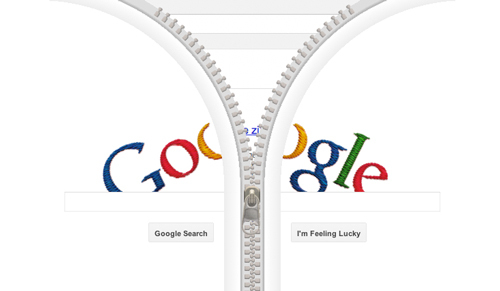 Today’s Google screen celebrates Gideon Sundbäck, the man who perfected the zipper. The letters look like they were embroidered and you can actually use your cursor to “unzip” the screen. Amazing. It’s the little things in life, people. While I’m incredibly thankful for the flexibility that the zipper has brought into our lives, I’m making a mental note to curse this man every time the needle on my sewing machine hits a zipper and makes that scary shuddering noise. Oh the things we learn from the Google Doodle. Happy birthday, zipper man!